Deborah Kimbrell one of first researchers to study innate immunity in fruit flies. This is one in a series of stories highlighting UC Davis’ role in space research as the country reaches the 50th anniversary of the moon landing. Deborah Kimbrell was a little girl growing up all over the world with Air Force parents when she began to get curious about space. She followed a liberal arts curriculum at Mills College, but a core class in genetics set her on the path to eventually achieving a doctoral degree in genetics at UC Berkeley. Kimbrell is now an emerita researcher in the University of California, Davis, Department of Molecular and Cellular Biology in the College of Biological Sciences, where she has been since 1999. One of the first researchers to study innate immunity in fruit flies, Kimbrell early on recognized its potential for modeling the effects of altered gravity on astronauts’ immune systems. In 2006, she and a group of researchers were selected by NASA to study just that. After weeks of lab work and research on location at Kennedy Space Center in Florida, they sent up 10 small containers, each similar in size to a television remote, with fruit flies that would lay eggs while on the space shuttle Discovery. Given the flies’ short life span (enabling long-term testing in a brief time) and immune systems strikingly similar to humans’, they were ideal subjects. Returning from the 12-day trip were hatched, 2-day-old, young adult fruit flies. 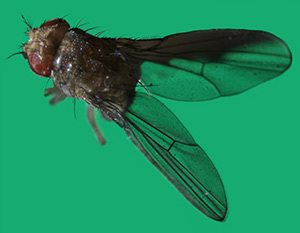 Kimbrell and her team from UC Davis and other universities tested the flies’ responses to two different infections: a fungus and a bacterial infection. A control group, which never left the ground, underwent the same tests. The spaceflight experiment was an extension of the ground-based research done by Kimbrell's UC Davis laboratory on the effects of increased gravity — research that continues today at NASA and UC Davis. “What we found is that in one kind of infection in flies that were raised in space, they did fine, and in another kind of infection, they really didn’t respond at all,” said Kimbrell. “The pathway that did not respond, the Toll pathway, is critical in humans for all kinds of health-related issues,” said Kimbrell. In fact, the Toll pathway response is involved in sepsis, which is still a big problem in human health, she explained. Kimbrell looked at the effects of microgravity (decreased gravity, like that in space) and hypergravity (increased gravity), which was simulated on a centrifuge at UC Davis — and is similar to what living beings experience in launch and landing of spacecrafts. The flies, or fly eggs, that had been exposed to hypergravity did much better than the flies who were not, suggesting that hypergravity treatment for astronauts before and after space travel could mitigate some health problems experienced after space travel. The idea that even short-term exposure to increased gravity during a ride on a roller coaster, for example, could potentially have a positive effect on immune response in humans comes from the boost demonstrated in fruit fly immunity during hypergravity exposure. Kimbrell​’s research, published in 2014, suggested that exposing astronauts to “normal” gravity like that on earth, or hypergravity while they are living on the space station could help mitigate some of the biological problems, including weakened immune response, experienced by those who have traveled in space. NASA developed a new Fruit Fly Lab in 2014 to accommodate continued study of Drosophila, or fruit flies, in space. This facility supports longer duration studies involving multiple generations of fruit flies. Additionally, centrifuge-based science was delivered to the International Space Station this year in the form of a mechanism that houses fruit flies and spins them quickly up to two times the force of gravity. Video: NASA continues study of fruit flies in space. NASA video on fruit fly research: "Spinning Science."